The golden bandicoot weighs 260 - 655 g (9.3 - 23.4 oz). It inhabits spinifex and tussock grasslands and was formerly found in desert and tropical woodland habitats. The golden bandicoot is terrestrial and nocturnal. It often makes long tunnels through the grass. The golden bandicoot also digs burrows in sandy soil during hot weather. It constructs a nest concealed in dense vegetation and made of flattened piles of sticks, leaves and grass, sometimes mixed with earth, with no obvious entrance. The nests are located on the ground or in a hollow log. The golden bandicoot is omnivorous, its diet including insects, small reptiles and roots. The golden bandicoot was formerly widespread in arid deserts and adjacent semi-arid areas and woodlands. It occurred widely throughout central Australia until the 1930's. But by 1983 it was thought to have become extinct in almost all of its mainland range except in the Prince Regent Flora and Fauna Reserve in the northwest Kimberley. It also occurred on Barrow, Middle and Augusta Islands. By 1995 it was known to occur in those locations as well as the Yampi Peninsula in north Kimberley and Marchinbar Island in northeast Arnhem Land, Northern Territory. Reasons for its decline may include changed fire regimes, exotic predators (especially the European red fox), and competition from rabbits. *** Aborigines considered bandicoots to be "old people's food," because they required little speed or strength to catch. 2004: Occurs in Australia (IUCN 2004). The golden bandicoot was formerly widespread in arid deserts and adjacent semi-arid areas and woodlands. Its distribution included the Tanami, Gibson, Great Victoria, Great Sandy and Little Sandy Deserts. It also occurred in northern parts of the Northern Territory and Kimberley, Western Australia, and was found on Barrow, Middle, Hermite (Pilbara), and Augustus Islands (Kimberley), off Western Australia. It occurred widely throughout central Australia until the 1930's. By 1983 it was thought to have become extinct in almost all of its mainland range except in the Prince Regent Flora and Fauna Reserve in the northwest Kimberley. It also occurred on Barrow, Middle and Augusta Islands. By 1995 it was known to occur in those locations as well as the Yampi Peninsula in north Kimberley and Marchinbar Island in northeast Arnhem Land, Northern Territory. Reasons for the decline of the golden bandicoot may include changed fire regimes, exotic predators (especially the European red fox), and competition from rabbits. The golden bandicoot weighs 260 - 655 g (9.3 - 23.4 oz). 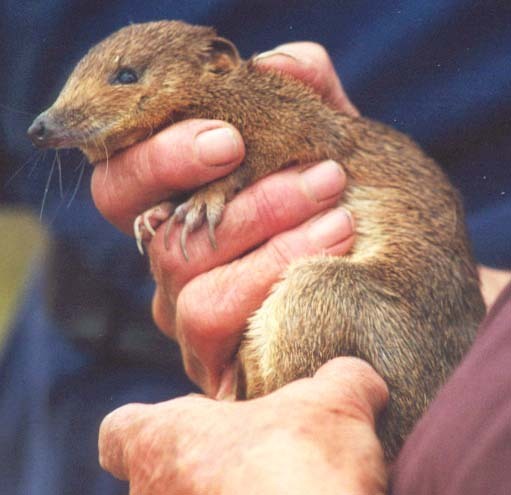 The golden bandicoot is one of the species that live in the Southwest Australia Biodiversity Hotspot (Cons. Intl.) . There are 2-4 young per litter. The golden bandicoot eats termites, ants, centipedes, moths, insect larvae, small reptiles, roots and tubers. The golden bandicoot sleeps during the day, hidden in a nest of twigs, grass, leaves and other ground litter.